Flying Storks Delivers Md Stork Sign Rentals in Maryland? Send a unique gift for new parents that will surprise and delight! 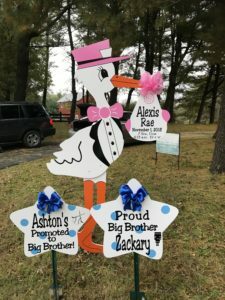 Reserve your Flying Stork lawn sign in advance or place your order at least 24 hours ahead of expected delivery of newborn baby announcement. Please feel free to contact us anytime. We are open 24 hours a day seven days a week. We accept almost all credit cards. We will need the spelling of the baby’s first and middle name, weight, length and date of birth. Also please have the delivery address, phone number, and any special delivery instructions included in notes. Flying Storks strives to arrive before mom comes home from the hospital, so let us know when mom and baby will be discharged. Our adorable 6 ft stork and personalized keepsake bundle will announce the BIG news for (7) days. Upon removal of the stork, the parents will be left with the personalized bundle to treasure forever. Surprise your loved one with this memorable gift! Call us at (301) 606-3091 for more information or to book your stork rental today! Please visit us on FB to see our most current rentals. Please follow us on Pinterest . We’re also on Google Plus too! Please contact Flying Storks at (301) 606-3091 to book your stork yard sign today! We deliver to Northern Virginia, Maryland & parts of West Virginia including: Adamstown, Aspen Hill, Beallsville, Bethesda, Bethesda Chevy Chase, B-CC, Boyds, Braddock Heights, Brunswick, Boonsboro, Clarksburg, Damascus, Darnestown, Derwood, Dickerson, Gaithersburg, Germantown, Green Valley, Knoxville, Ijamsville, Jefferson, Monrovia, Myersville, Middletown, Mt. Airy, Olney, Point of Rocks, Potomac, North Potomac, Poolesville, Rockville, Silver Spring, Woodsboro, Urbana, Walkersville, MD. All of Montgomery County, Maryland and Frederick County, Maryland, Washington County Maryland, Loudoun County, Virginia including areas around Leesburg VA, Winchester VA Harpers Ferry, Charlestown West Virginia & Georgetown Washington D. C.
*We are often able to accommodate rentals that are greater distance than these areas. Please contact us for more information.